Come along to this information session and find out how the Supreme Court of Victoria improves access to justice for Victorians and ensures that disadvantaged and vulnerable people receive the support they need when they engage with the law and justice system. 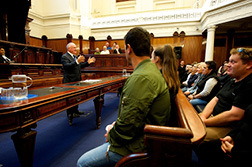 Discover the wealth of information on the Supreme Court’s website, available to help people navigate the court system when representing themselves, including videos, self-help guides and legal glossaries. Learn about the free legal advice service pilot program being run by Justice Connect for the Supreme and County Courts for eligible self-represented litigants.